Our temporary traffic signs fit like a paper clip on traffic cones, open top delineators and traffic barrels (for installation on traffic barrel, cut a 2.5 inch slit in top of barrel next to edge). A great solution for temporary portable signage. Installs easily. Our cone signs are reusable, durable, all-weather solid ABS plastic. Reflective. 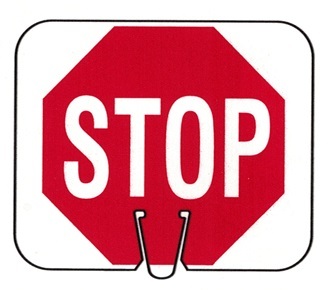 Go to top of this Reflective Stop Portable Cone Sign page.